As technology advances and better investigative and treatment options are introduced, the need for professionals equipped to handle newer diagnostic modalities are on the rise. The ever changing & ever expanding horizon of the health care sector demands formal training programmes in all its allied areas. The diagnostics sector, today is witnessing a tremendous growth in terms of volume and sophistication. With increasing advances and super specialization, the scope for tomorrow’s technologists does not remain limited to just routine tests. Advanced complex instrumentation & equipment require technocrats not only to operate but also to care & maintain them as well. These experts have to possess a strong scientific foundation & be able to perform at a much higher level than the traditionally trained technicians of the past. The students thus trained in the technological aspects of medical care with a good scientific foundation will be in a position to competently assist the Physician or Surgeon, especially in high-tech medical procedures to cater to the health care industry globally. Std. XII Pass with any two of the following subjects : Physics, Chemistry, Biology, Botany, Zoology, Biochemistry, Microbiology, Mathematics OR equivalent as decided by competent authority. Working Professionals: For the candidates who have educational qualification and work experience in the mentioned specializations, admissions will be given directly to 2nd year subject to approval of the SIU. Based on marks in XII Std. Science / Equivalent Examination followed Entrance test & Personal interview and written ability test. 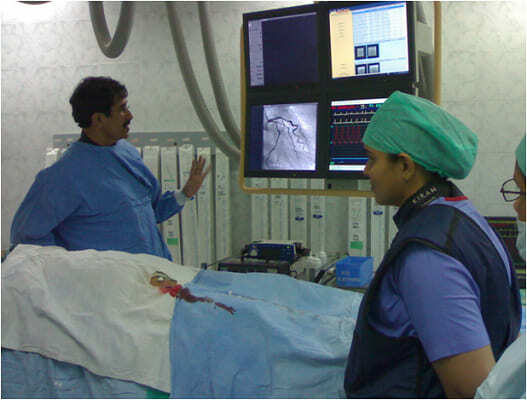 Cardiac Care Technology The Cardiac Care Technologist is responsible for direct and indirect patient care, haemo-dynamic monitoring, equipment set up and operation. They assist the physician during cardiac procedures and assume responsibility for completion of other cardiac lab functions. Respiratory Therapy The Respiratory Therapist is a key member of the medical team, specializing in diagnostics, treatments and procedures in the care of patients with respiratory problems. 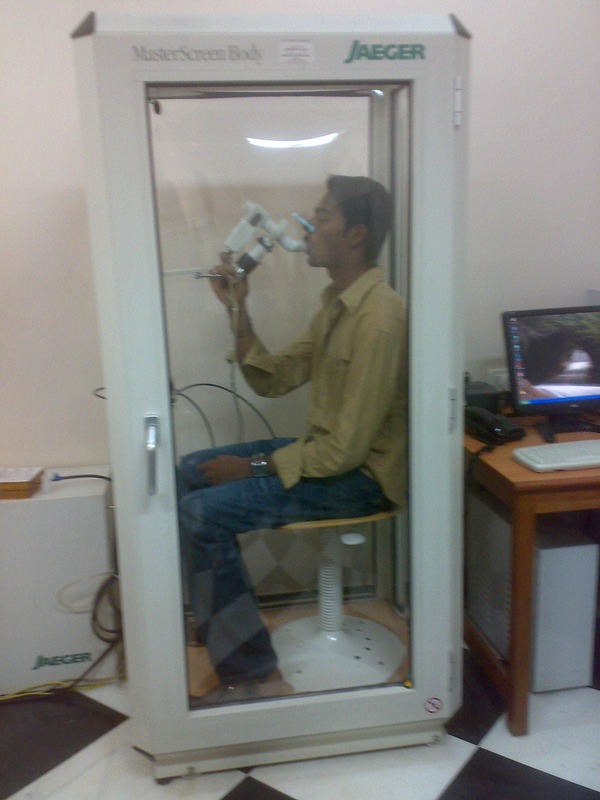 They evaluate, treat, and care for patients with breathing disorders. Dialysis Technology Dialysis Technologists operate machines that remove waste and excess fluids from the blood of patients whose kidneys can no longer carry out those functions satisfactorily. 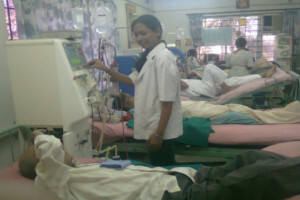 The programme is designed to provide competencies & technical skills necessary in the field of dialysis. 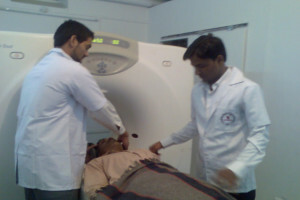 Imaging Sciences Technology Imaging Sciences Technologists are health professionals who facilitate diagnosis and management through the creation of medical imaging modalities like X-ray, Ultrasound, Magnetic Resonance and Computed Tomography. Clinical Lab. Technology Clinical Lab. Technology is concerned with the analysis of biological specimens to support diagnosis and treatment of disease. Laboratory Technologists perform a full range of laboratory tests, the information of which influences the medical treatment a patient will receive. 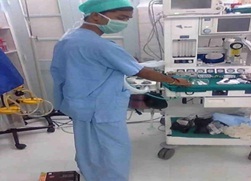 Operation Theatre and Anaesthesia Technology The Operation Theatre and Anaesthesia Technologist is responsible for direct and indirect patient care, equipment set up, Pre, Intra & Post-operative procedures. Laparoscopy & Endoscopy Technologists learn the fundamentals & skills required to assist the Surgeons conducting Laparoscopy procedures and Physicians in Endoscopy procedures at various clinical establishments. Ophthalmic Sciences Technologists pursuing Ophthalmic Sciences specialization deal with the technical aspects of ophthalmic procedures required for diagnosis and treatment of eye disorders & diseases. The technologists so trained would be in a position to competently assist the Ophthalmologists. 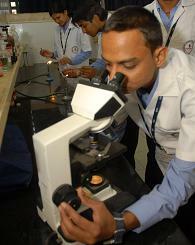 Neurosciences Technology Neuroscience technology is a fast developing field in medical science. The students will acquire skills to assess the patient, plan various electro-diagnostic procedures, and implement them in the neurosciences laboratories. The programme include both theoretical & practical knowledge of the Diagnostic Investigations, Therapeutic procedures and Equipment as applicable to the health care sector today. It introduces students to emerging technologies and their applications. Students spend a considerable part of their learning time in hospital set-ups where they are exposed to actual 'hands on' practical training. Each student works on a project related to his / her specialization. The well-equipped health skill laboratories facility strives to provide high –tech simulated and virtually created hospital set-up for teaching, training and assessment for all health care professionals in clinical and related management skills. The broad objective is to align with the National Agenda of Skill Development to create robust and vibrant eco system for quality education and skill development in the healthcare sector in the country. This simulation-based training is an integral part of education and training in Medical Technology and helps students to expertise the technical competencies followed by real time “Hands-On” practical training in hospital. As part of their curriculum, students are taught additional modules on Management issues relevant to the respective specializations. The students are also trained in soft skills, Basic Life Support (BLS), Advanced Cardiac Life Support (ACLS). The Global Immersion Program (GIP), Inter Institute Credit Transfer Program, Liberal Arts & Social Services exposes the students to the external world & helps in the overall development of the student. There is emphasis on a multidisciplinary approach towards achieving professional success. The Medical Technology programme will have a total of 150 credits in 3 years. Each credit is defined as 15 hours of teaching (Lecture or Lecture demonstration) or 30 hours of supervised practicals. Each credit is assessed for 25 Marks. For all external courses internal assessment will be of 40% and external assessment will be of 60%. Practicals will be 100% external. Internal courses will be evaluated 100% internally by the institute. B.Sc. (Medical Technology) Degree will be awarded at the end of 3 years, taking into consideration the performance of the candidate in all examinations conducted throughout the three years. The programme fee includes examination fees and Convocation & Transcript fees. Dr. Sammita Jadhav, Deputy Director, Symbiosis Institute of Health Sciences. Dr. Anita Shenoy, President, Indian Association of Respiratory Care (IARC). 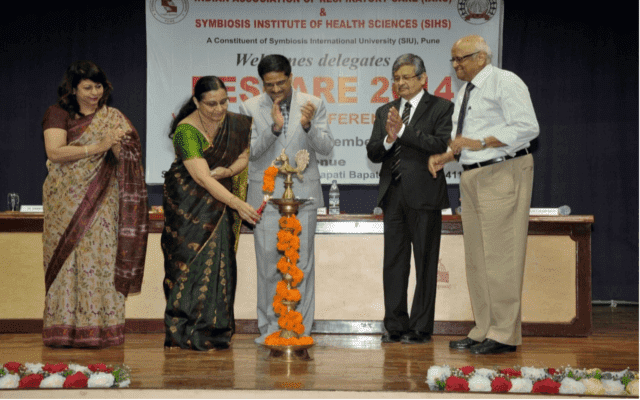 Dr. Rajiv Yeravdekar, Dean, Symbiosis Institute of Health and Biomedical Sciences, SIU. Chief Guest: Dr. Shirish Prayag, Managing Director & Chief Consultant in Critical Care Medicine, Prayag Hospital, Pune. Prof. Vijay Deshpande, Prof. Emeritus, Respiratory Therapy, Georgia State University, USA.